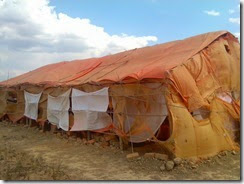 The sanctuary of El Shaddai church, where we met, turned out to be a large tent-like structure in a wide-open land. 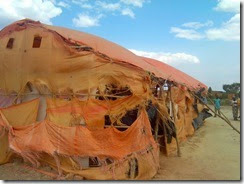 It was dusty and windy, and scattered about were several small red brick huts. On the church’s property, there are piles of those same red bricks – 15,000 of them says pastor Bertin Mwanya. 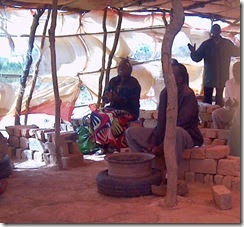 Those bricks will be used to construct a more permanent church building, as soon as the church body is able to do so. They hope to get that construction done before the rainy season in October. Until then, the sanctuary is a sparse wooden frame covered with various different types and colors of materials. Inside, some of the red bricks have been piled in place, where they serve as makeshift pews. There are several musical instruments present, and all are them are percussion instruments. There are drums made from hollowed out tree trunks. There is also a steel drum of sorts, consisting of the tire rim of an automobile, and played with drumsticks which are two steel wrenches! That drum can produce a lot of sound. The songs sung to this accompaniment are wonderful songs. I obviously did not understand any of the word (my Kiswahili being somewhat rusty) but it was not hard to hear the hearts of the singers. I was struck by intensity of the lyrics, and that impression was even more accentuated by the looks on the faces of the worshippers. Only the song leader had a song book – a thin paperback containing only words. My first impression was that there did not seem to be much difference in the tunes, but I learned later that much of the differences had to do not with the notes produced, but their speed, rhythm and loudness. The singing is not all unison; additional phrases are added by singers from various places in the sanctuary. Rather than causing confusion, that adds to to spontaneous nature of the worship. I wish we could all sing like Africans!